Bible storytellers share stories written thousands of years ago for others to experience today. But because of their unique phase of life, kids have difficulty seeing how that ancient story impacts their modern life. To make it easier for them, storytellers can use moments from their own life as concrete examples of how the Bible story applies to the everyday world. Your personal story deserve as much care and development as the stories you share from the Bible. Sometimes we want to tell a story because it’s funny. We somehow think that by telling this edgy part of our life that the kids will think that we’re cool. The story doesn’t quite fit, but we’re willing to look past it because of the cool factor. It’s easy to fall into this trap: wanting the kids to like us more than we hope the story will connect them to something deeper about God. Before we start to develop the story, we need to choose the right story. And that starts with checking our motivation and asking ourselves why we want to tell the story in the first place. If the primary motivation behind wanting to tell that story is more about you than the kids, chances are you need to choose a different story. Make sure the story you choose is the BEST moment from your life to help kids connect with the main point of the message. Just as much as storytellers need to memorize and rehearse the Bible story, they should treat their personal story with the same care. Only with a personal story, they aren’t given a script to memorize; storytellers will need to write these out for themselves. When it comes to writing down these moments for our life, we tend to think we can just wing it because, after all, these moments actually happened to us. Unfortunately, for most people, their brains don’t work that way. Memories fade over time and details might not come into view until you’re telling the story and the brain starts piecing memories back together. Write the story down a couple weeks before you need it, allowing the brain time to work and recreate the story in your mind. Take the time to write down exactly how you want to tell this story. This doesn’t mean that you have to memorize it word for word, but writing it down will help you organize your thoughts and remember the details of the story you might otherwise forget. TIP: The brain awakens when you engage both sides of it. 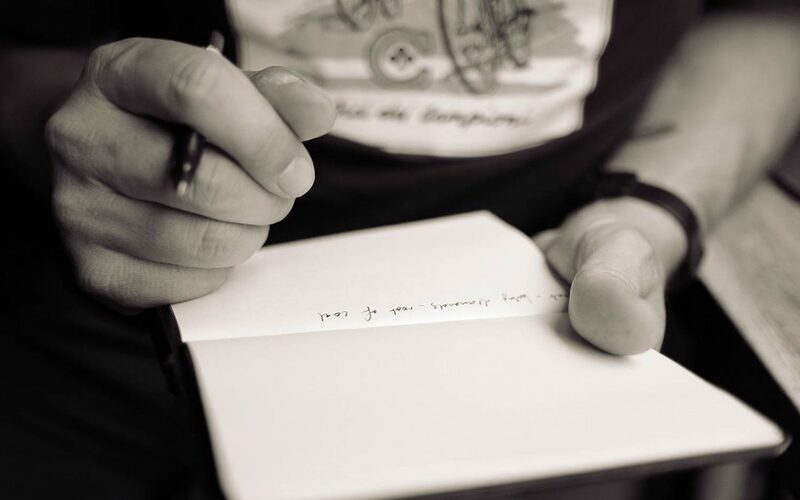 Use pen and paper to handwrite the story to increase your chances of recalling those details and memorizing the story. After choosing the right story and writing it down, it’s time for some editing. Read through the story a few times. Then have someone read it back to you. Or record yourself reading it and listen to the playback. Consider how your audience might hear this story. Consider the topics, the details you include, the words you choose, and the length of the story. This may be the PERFECT story to share to connect with your audience, but how you’ve crafted this story appropriate for your audience? Not all topics and words are suitable for every audience. Kids have a limited attention span and vocabulary. Edit out the words and details that would be lost on this age group. If you find that you can’t edit out those details and still get to the heart of the story, you’ll most likely need to find another story that will work with that age group. Keep in mind that your personal story is part of a larger story you’re telling during large group. Consider how long it will take to tell this story and connect it back to the Bible story. Edit the words down to the bare minimum you need to tell the story. Just because the story happened to you, doesn’t mean that you tell the story well. Just like any other story you plan to tell on a Sunday morning or Wednesday night, take time to run through how you’re going to tell this story. Pay attention to the pacing and build of the plot line. Tell the story with momentum that carries the audience all the way through to the punch line or heartfelt moment you’re trying to create. Have someone you trust listen to you share this story and ask them to give you feedback. Take that person’s notes into consideration as you continue preparing. Remember you’re taking your audience on a journey. Help them experience your story not just for entertainment or a good laugh. Use your story to help kids connect their story to bigger truth God is speaking in their life. Help kids see how God still interacts with people today. Your Turn: Comment below with ideas for how you write and rehearse your personal stories. A Storyteller’s Manifesto: my ebook on the power of story and the need to understand the three narratives at play when we tell a Bible story.